We Pay CA$H for equipment! The value of having more warehouse space without expanding your square footage is important for your bottom line. There are a number of ways to get more storage space out of your facility by using our various, effective storage and racking systems. We have cantilever rack systems, push back racking, steel rack systems, warehouse pallet racking systems, and industrial heavy duty racking. Check these systems out on our website or let one of our representatives tell you about the benefits of each. We offer everything you need in Chino, CA, to get the most storage possible out of your existing facility. Whether you want a newly-designed warehouse or simply re-configuring your current one to boost storage space availability and loading flow, we’re here to help. From simple racking systems to the most complicated ones, we offer them all, and we’ll help you find the one that suits your needs best. We don’t provide just racking systems – we offer complete solutions. This means we’ll help you design the best layout for your warehouse using both the experience of our engineers and the assistance of software. Our warehouse pallet racking systems are designed to help you get the most out of your current space. Adding square footage to your building isn’t always possible or financially feasible. When you’re in this situation, you need racking systems that will increase your storage exponentially. We believe that offering a complete solution helps you focus more on your own business, and lets us do what we do best: create state-of-the-art warehouses for our clients. 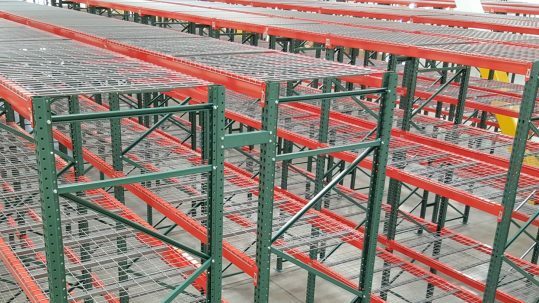 To learn more about our warehouse racking systems, give us a call today. Our friendly associates and racking specialists are more than happy to answer your questions. Our priority is to make sure all warehouses in Chino have access to quality storage solutions for optimal results. Professional and reliable installation of the racking systems. We'll design a custom layout for your exact needs. Once your order is finished, we'll ship it quickly and safely.